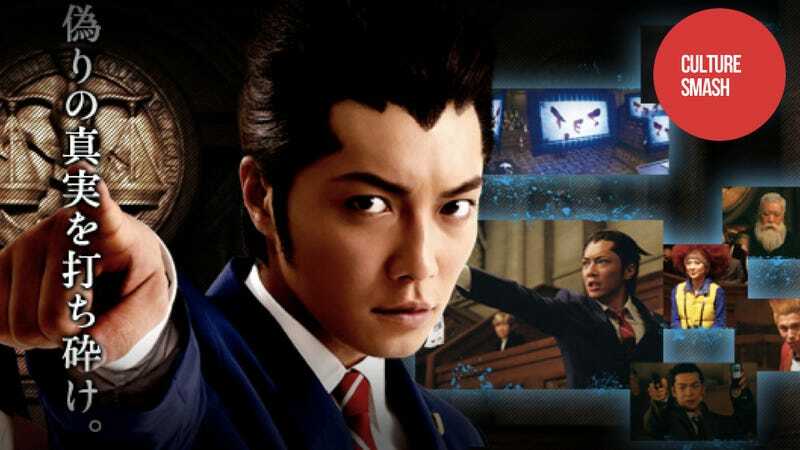 Could Phoenix Wright Be the First Truly Great Game Movie? Capcom's had so-so luck with movies. That is, depending on your opinion of the Street Fighter movie, the Chun-Li picture, and the Resident Evil flicks. With the upcoming Phoenix Wright, n&eatcute;e Gyakuten Saiban, motion picture, that luck might be changing. The movie's most recent trailers look fantastic. Maybe, I'm the eternal optimist, but I feel like I'm continuously writing "this game movie might be good" articles. Sadly, those movies end up being rotten, and so could this, too. The Phoenix Wright movie, however, has a handful of things going for it. One being that the actors, such as Hiroki Narimiya, actually look like the characters. They're not doing cosplays or impersonations, but rather, they look like live-action versions of their Gyakuten Saiban counterparts. This isn't always important, but the trailer doesn't feel like the filmmakers are trying too hard—either to be realistic or simply be a cinematic version of the game. Make no mistake, this movie is Phoenix Wright. The games center around dark things, such as murder, but are often brightly light and even goofy. This trailer looks dark. This trailer makes the movie appear as though it retains its sense of humor, yet, at the same time, it's sinister. Judging a 2 hour film by a short trailer is difficult, but hopefully, the final product pulls off this tricky balancing act. The movie doesn't sound dumb—a big plus for a game movie as most game movies sound utterly inspid. It is set during this decade. With a dramatic increase in crime, the legal system has been changed so that court cases must be tried in three days. There are neat flourishes, such as how evidence is presented, via holograms. Apparently, it's even possible to chuck the holograms at each other. Feature films and books are able to be both silly and serious at the same time, brutally funny and brutally violent—ditto for video games. Yet, when video games (and, in the past, comic books) are turned into movies, filmmakers tend to lean more to the silly side, resulting in stupid movies that never feel like there's much at stake. It's as though the filmmakers think that just because players have extra lives or can restart games, that they don't care about dying. Everything becomes trivial. Another thing that Phoenix Wright has going for it is that Takashi Miike is directing it. Miike has made a lot of great pictures. He's also made a lot of crap—I mean a lot. And he apparently views directing as a regular job; he is a gun-for-hire. Even as a gun-for-hire, he's turned out some brilliant, edgy pictures. If the Miike who directed Ichi the Killer shows up, Phoenix Wright could be a very interesting movie. If the Miike who directed Yatterman shows up, then, well, yeah. Earlier this year, Miike described the movie as a "very light comedy." And this trailer looks nothing like a "very light comedy". Is One of Japan&apos;s Bloodiest Directors Working on an Ace Attorney Movie? A key thing for Phoenix Wright is that Japan is making this movie. While the lead character's name has been localized to "Phoenix Wright", he is "Ryuichi Naruhodo" in Japanese, and the games always feel like they're Japan's take on not only the U.S. court system, but also American lawyer dramas. If the movie was made in Hollywood and completely white-washed like Akira, much of that cross-cultural interplay would be lost, and we'd be left with another kooky Hollywood legal movie. Is Hollywood Having a White Guy Once Again Play a Japanese Character? The Japanese film industry ran out of steam during the 1980s. TV, video games, and anime are the main drivers in Japan, and there are only a few feature films released each year. Next year, one of those will be based on an incredibly popular series of video games. Somehow, it seems fitting. Court room dramas often make good cinema. Even if this is a "very light comedy", the trailer's sinister edge gives me hope, and it should give you hope, too. And so should the judge's beard.